DOUBLE the working life of your No Smoking Including Electronic Cigarettes Signs by adding 3M Protective Overlay Film (POF)! 3M’s high-tech POF protects sign faces against fading caused by the sun and harsh weather—and makes graffiti and sticker defacement damage easy to clear away without harsh abrasives. Prohibit Smoking in your establishment including the newest form of smoking: Electronic Cigarettes. 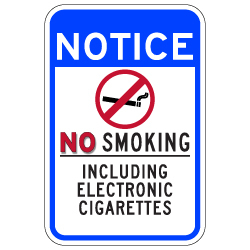 Probably the most common property management sign, other than Exit and Entrance signs, is the No Smoking sign, and other signs that regulate or restrict smoking and designate smoking areas. Many states have laws that determine how close to public areas and buildings smoking allowed areas can be located. And with many states having large Spanish speaking populations, using the no smoking symbol as well as the words, "No Smoking" makes the message clear in any language.